Experience the luxury and elegance of this recently restored Grade 11* listed Georgian Hotel. The hotel is within the town centre of Goole and minutes away from all major travel networks. Walking distance from the train and bus stops. A taxi rank is just 100 yds from the hotel, call us and we will arrange a taxi for you. You will be welcomed upon arrival to our family run hotel by friendly and attentive staff, making you feel The Lowther Hotel is a genuine home away from home. Relax in our ‘Voodoo Chilli’ Cocktail Bar and be spoilt for choice in our New Eddie’s Bar & Bistro Restaurant. Welcome to The Lowther Hotel. 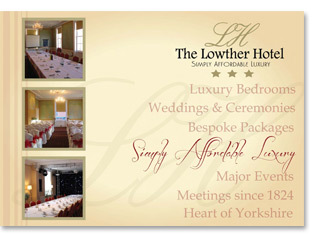 The Lowther Hotel is minutes from the M62 Junc. 36 which is just a couple of miles from the top of the M18. Roughly 40 minutes from Hull, 40 minutes from Leeds, 40 minutes from York and 40 minutes from Doncaster.